A slightly darker shade than our pink pearls, lavender pearl pendants (also known as lilac pearl pendants), add a touch of refinement to our coloured pearl collection. Round or drop shaped, in gold or silver, lavender pearl pendants are a favourite of younger pearl wearers, and enjoyed by women of any age who like the softer, prettier things in life. 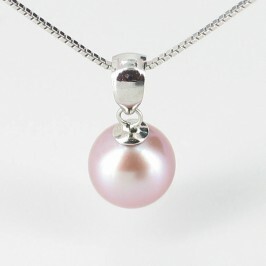 Lavender pearl pendants are a delightful choice that complements a wide range of clothing colours and necklines. Our high quality lavender pearl pendants can be finished with either shining, rhodium plated sterling silver, or traditional yellow 9K gold to stunning effect. Whichever you choose, you’ll receive a safe, secure 17½” chain in the matching metal with our compliments. 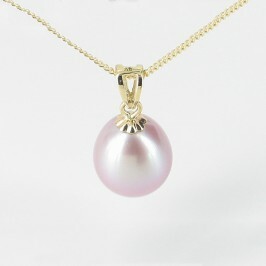 Lavender pearl pendants are a welcome gift, whether you are sixteen or sixty. Fun, feminine and very romantic, the soft floral shades of lavender pearls are a gorgeous for to someone special.